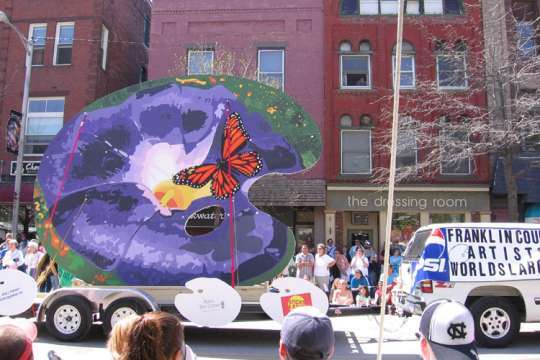 The World's Largest Palette made its public debut at the 40th annual Vermont Maple Festival, April 28-30, 2006, in St. Albans, Vermont. About 50,000 visitors saw it. The World Record attempt requires measurement by two independent witnesses with standing in the local community, meaning that they must be prominent and respected. Governor Jim Douglas measured the World's Largest Palette at Bay Day on July 2, and engineer Sam Ruggiano, PE, of Ruggiano Engineering measured it on July 12, 2006. The World's Largest Palette record effort is sponsored by the Peoples Trust Company, R. J. Fournier, Sticks and Stuff, and Union Bank. It is a project of the All Arts Council and St Albans for the Future. SUPPORT LIVE ARTS IN YOUR TOWN!